Campo de' Fiori, a square in Rome, Italy, serves as a marketplace of fresh fruits and vegetables and a place where locals mingle and entertain. Fiori, therefore, represents the line of fruits and vegetable styled cabinet pulls and knobs by Vicenza Designs. 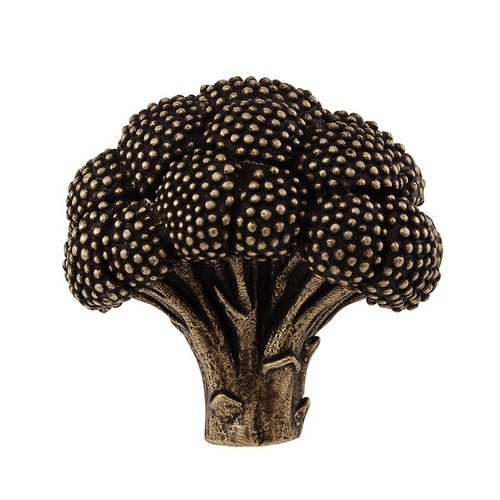 The broccoli designed large knob is available finishes include Antique Brass, Antique Copper, Antique Gold, Antique Nickel, Antique Silver, Gunmetal, Oil-Rubbed Bronze, Polished Gold, Polished Nickel, Polished Silver, Satin Nickel and Vintage Pewter. Mounting hardware is included. 100% lead free pewter. Handcrafted in the USA. Campo de' Fiori, a square in Rome, Italy, serves as a marketplace of fresh fruits and vegetables and a place where locals mingle and entertain. Fiori, therefore, represents the line of fruits and vegetable styled cabinet pulls and knobs by Vicenza Designs. The banana designed pull is available finishes include Antique Brass, Antique Copper, Antique Gold, Antique Nickel, Antique Silver, Gunmetal, Oil-Rubbed Bronze, Polished Gold, Polished Nickel, Polished Silver, Satin Nickel and Vintage Pewter. Mounting hardware is included. 100% lead free pewter. Handcrafted in the USA. Campo de' Fiori, a square in Rome, Italy, serves as a marketplace of fresh fruits and vegetables and a place where locals mingle and entertain. Fiori, therefore, represents the line of fruits and vegetable styled cabinet pulls and knobs by Vicenza Designs. The tomato designed large knob is available finishes include Antique Brass, Antique Copper, Antique Gold, Antique Nickel, Antique Silver, Gunmetal, Oil-Rubbed Bronze, Polished Gold, Polished Nickel, Polished Silver, Satin Nickel and Vintage Pewter. Mounting hardware is included. 100% lead free pewter. Handcrafted in the USA. Campo de' Fiori, a square in Rome, Italy, serves as a marketplace of fresh fruits and vegetables and a place where locals mingle and entertain. Fiori, therefore, represents the line of fruits and vegetable styled cabinet pulls and knobs by Vicenza Designs. The asparagus designed pull is available finishes include Antique Brass, Antique Copper, Antique Gold, Antique Nickel, Antique Silver, Gunmetal, Oil-Rubbed Bronze, Polished Gold, Polished Nickel, Polished Silver, Satin Nickel and Vintage Pewter. Mounting hardware is included. 100% lead free pewter. Handcrafted in the USA.